Planning a refurbishment, a brand new kitchen or designing a room from scratch? We’ve found the best free online room planner tools to help you design the home of your dreams. If you’re designing a kitchen, living space, study, bedroom or garage, House Plans Helper is a brilliant place to start. With plenty of layout suggestions, free floor plan software and an easy guide to floor plan symbols and meanings, you’ll also find plenty of handy hints along the way. Not sure whether a galley or u-shaped kitchen would work best? This is great site to help you choose the right floor plan for your home. Home By Me is like being your own designer and architect in one. You can draw your floor plans in 2D and 3D then download and share them with the professionals. There are plenty of home related design tips and with the interior design option, you can add furniture, repositioning sofas and coffee tables as often as you need to ensure everything’s in the right place. There’s a 3D kitchen configurator tool to help you find the right layout options as well as potential costs, and an interior designer you can contact online for advice. Don’t forget to check out their impressive gallery too if you’re after some floor plan inspiration. RoomSketcher is for everyone, whether you’re designing as a hobby or a professional creating 2D and 3D floor plans for a client. If time is tight, they can create a floor plan for you, but it’s so easy and fun to use that within a few clicks you’ve got a new home layout with walls, windows and furniture ready to go. Simply transform it into a 3D render and you’re done! 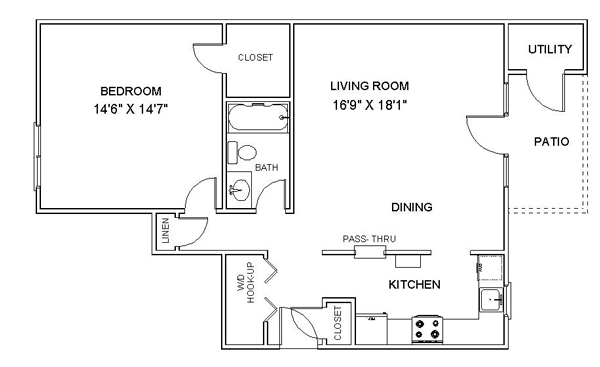 Floor Plans is perfect if you’re unsure about creating your own plans and you’re looking for some inspiration. So long as you know how many rooms you need and the architectural style you prefer, you can view over 30,000 designs. This site loves an open plan layout so you can see what they have to offer and grab the design for yourself. Good luck with your floor plans and don’t forget our other guides have plenty of advice when it comes to which kitchen styles and designs might suit your lifestyle. Happy designing!